Crowns, Bridges and Veneers Crowns Crowns are basically caps designed to fit over your teeth to further improve their strength, colour and shape. Though they can be made of gold, most are now made of all porcelain or porcelain on a hidden metal covering. 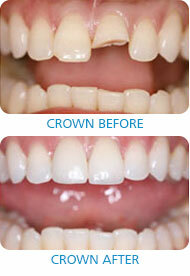 A crown is a tooth-shaped cover placed over a tooth that is badly damaged or decayed. A crown is made to look like your tooth. Many people call it a cap. Crowns may be used for a number of reasons. Usually the tooth has been broken or damaged a great deal by decay. As a result, a filling can't replace enough of the tooth or make the tooth strong enough. A crown may hold together parts of a cracked tooth. It also can be used to hold a bridge in place. Crowns could also improve the appearance of teeth. They may be placed to cover misshapen or badly discolored teeth. 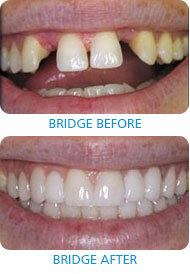 Bridges Bridges are simply crowns on one or either side of a gap, joined to cover the missing teeth. Bridges are most commonly introduced to replace one or more missing teeth. As with crowns, you have a choice of materials for bridges. We can help you make a decision regarding which to use, based on the location of the missing tooth (or teeth), its function, aesthetic considerations and cost. Porcelain or ceramic bridges can be matched to the color of your natural teeth. Veneers Porcelain veneers are thin shells of porcelain that fit over the front of your teeth....they are simply stunning! 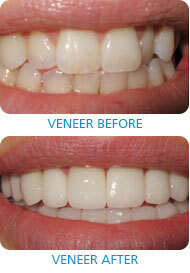 Veneers allow you to have perfect teeth, and help you obtain a perfect smile. They improve smiles by whitening and straightening teeth, closing gaps, reshaping broken of worn front teeth and even help when teeth are twisted or out of place. Brighter, whiter smiles convey confidence, health and well being; and often leaves a lasting impression. Veneers can change a dull smile into one that lights up a room. We've come to notice over and over the way people's confidence soars with a striking smile.